It’s sketch challenge time over at Splitcoast today. And, I’ve taken a little liberty with the sketch but that’s what it’s all about isn’t it? Using a sketch to spark your creativity, to stretch your brain, just using it as a jumping off point for your card. I’ve used a standard A2 card base in Crumb Cake. The next layer is some designer paper that’s been dry embossed and distressed. The tab shaped piece is another piece of paper from the same collection that’s also been distressed. 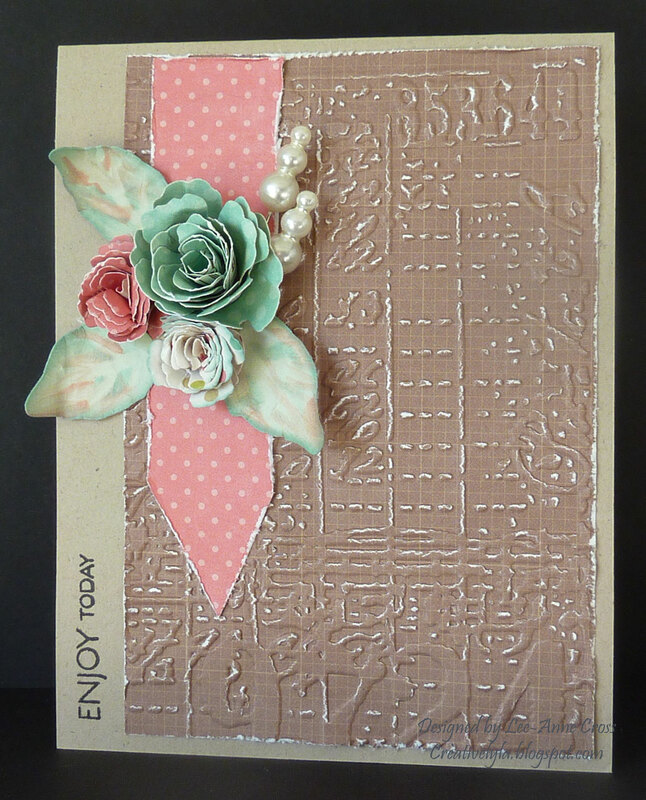 My flowers and leaves are made with coordinating designer papers from the same collection and made with the Spellbinder’s Bitty Blossoms dies. I embossed the leaves and inked them, then they were just shaped a little with my fingers. A couple of pearls pins, a quick sentiment and done! To save the recipient’s fingers from being stabbed with the pins, I stuck them into the tab shaped piece so that the ends were well hidden. I think they’ll appreciate that don’t you? That’s it for today! Have a wonderful evening! Lee-Anne, this is totally tre-chic! Your interpretation of the sketch is wonderful! The flowers are just plain beautiful. Previous Previous post: It’s about time!